Titanic. The name is iconic. It may be the most recognizable tragedy at sea. For more than 100 years, the sinking of the unsinkable Titanic has pulled at the heartstrings of humanity. Today, on the very site on which the Titanic was built, Titanic Belfast offers a unique Titanic visitor experience. We chatted with Tim Husbands, Chief Executive of Titanic Belfast. 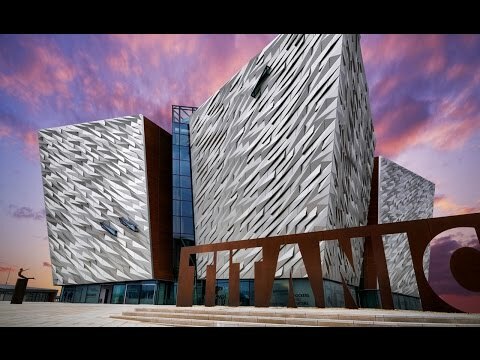 In one sentence, what is the Titanic Belfast? Titanic Belfast is the world’s largest Titanic visitor experience, located in Belfast, Northern Ireland, on the very spot where the legendary ship was constructed and launched over 100 years ago. Titanic Belfast is a world-class exhibition which tells the famous ship’s story from conception in Belfast in the early 1900s, through to her construction and launch, to her famous maiden voyage and tragic end. The story is brought up to the present with the discovery of the wreck and with live links to contemporary undersea exploration. Using innovative design, interpretation, technology and artifacts such as the last letter ever to be written on board the Titanic by Essex-born Esther Hart to the historic plan prepared by White Star Line architects for the Board of Trade for the British inquiry, Titanic Belfast brings history to life. As part of the Titanic Belfast ticket, visitors can also experience SS Nomadic the last remaining White Star Line vessel and the biggest Titanic artifact in the world. Visitors can follow in the footsteps of Charlie Chaplin, Elizabeth Taylor, Richard Burton, Marie Curie, the first female Nobel Prize winner, Hollywood legends past and present, American socialites - all of whom traveled on SS Nomadic. The vessel also served in World War I and II, as well as luxury liners Queen Mary and the Queen Elizabeth. Visitors can now experience a rich, tangible and authentic piece of Belfast’s industrial and maritime heritage, in additional to the Titanic Experience. In addition to the Titanic Experience, Titanic Belfast offers an one-hour bespoke Discovery Tour (a walking tour) which provides guests with the opportunity to walk in the footsteps of the men who built Titanic - the world’s most famous ship – in Belfast's historic shipyard, explore the history of the famous barrel-vaulted Harland & Wolff Drawing Offices where Titanic and the rest of the mighty 'Olympic' class ships were designed and at the maritime metaphors hidden within the architectural design of Titanic Belfast. Why does the Titanic remain such a worldwide sensation after 100+ years? Although the Titanic lies in 13,000 feet of water, the enduring story still captures minds and hearts throughout the world, Titanic Belfast is living proof of this. In the four years, we are delighted to have welcomed three million visitors from over 145 countries, who have discovered the story here in Belfast, the home of the Titanic! At Titanic Belfast, we never rest on our laurels – we will continue to develop and build upon Titanic’s legacy. We are constantly evolving! This is vital for us to keep attracting new and repeat visitors from domestic, national and international markets.